Do you think the world is heating up? 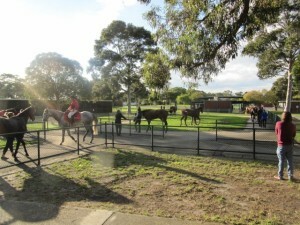 Here we are on the last day of April and Caulfield is a balmy 24 with a blustery northerly. Zandarral is in a muck lather. I rarely see this, even in the height of summer. My views on sweating are quite well-known and normally sweating up is not a problem if the ambient temperature is greater than 20 degrees. But there are exceptions, especially if the horse shows other signs of anxiety or fear. Zandarral had the nose roll, which rules him out straight away in my book, but also had his head up and was changing stride, forcing the strapper to use two hands. And I noticed the horse dumping and head-shaking. A pretty obvious lay. It was showing $1.50 the place on the tote which raised my heartbeat, but on firing up Betfair it was $2.78 the lay! Way above my $1.80 limit. Too bad! Everyone has seen him! The horse faded in the straight to finish eighth. And yes, I do think the world is warming. My eye was taken by a striking filly in the first race, Miss Vista. An Apache Cat clone, but even more so with a touch of albinism and a walleye. 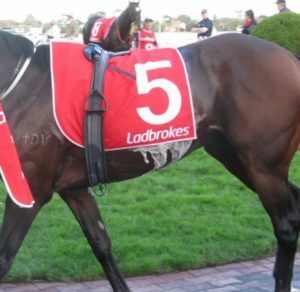 There is a buzz about this horse since she won her maiden in good style. 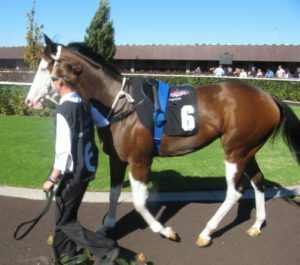 The filly ran up to her good looks and after only two starts is now regarded as something of a cult horse. The trouble with being a cult horse is that it will always run under the odds, carrying the weight of popular money. 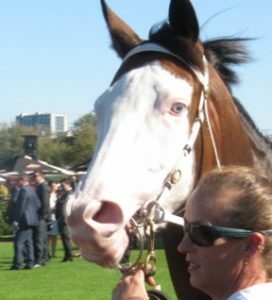 But the best-looking horse I saw on the day was the Freedmans’ Cool Chap, who had that indefinable “presence” and looked like he owned the mounting yard. He won the time-honoured St Leger in a most convincing fashion. Nothing to report, unless you count Red Bomber! 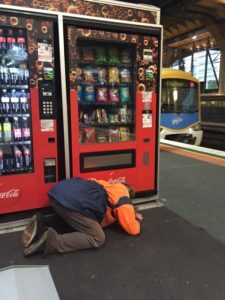 You can tell things are pretty desperate when all I could find to photograph was a disadvantaged person scrabbling under the vending machine while I was waiting at Southern Cross station. He must have been under there for some five minutes before emerging triumphant with a $2 coin in hand. I congratulated him heartily! He gave me the bottoms up sign. A drink! That’s what you need to be a winner. Determination and discipline! Especially with such a miserable implement! 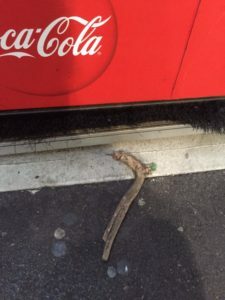 Where do you find a piece of tree on the platform at Southern Cross?